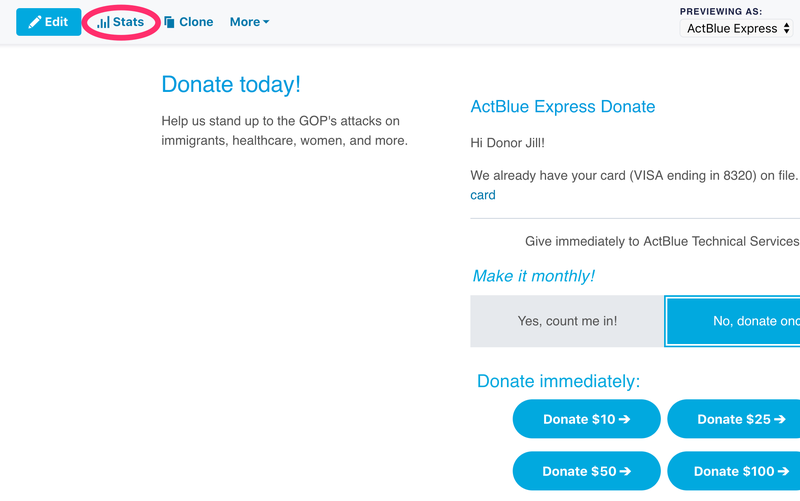 Tandem Fundraising is an exclusive ActBlue feature that allows campaigns, organizations, and activists to fundraise for multiple groups on a single contribution form. When a donor gives on a Tandem Fundraising form, they can easily split their contribution between all of the groups listed (or choose which ones they’d like to give to). You can create a form for your own campaign or organization and add others who are working alongside you in your issue area, or you can create a form that lists groups you’d like to help support. 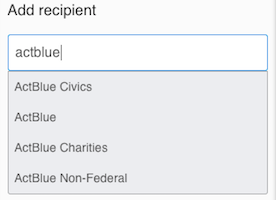 If you're a campaign or organization hoping to raise money for yourself and others, please check in first with your ActBlue account manager to go over some guidelines before creating your Tandem form. Donors can also create Tandem forms with their favorite candidates or organizations and send them to their personal networks. Check out our blog post on creating nominee funds for an example. Whether you’re a senator looking to keep your email list active between elections, an organizer working to elect officials that will fight for your cause, or a charity working with other nonprofits to respond to a crisis like a hurricane, Tandem Fundraising is a powerful tool. Before creating your form, make sure you understand whom you can and cannot legally fundraise for. If your organization is designated as a 501(c)4 you have the ability to fundraise with other 501(c)4s, political groups, or 501(c)3s. If your organization is a 501(c)3 you can fundraise with other 501(c)3s and 501(c)4s, but not with political groups. If you’re a political candidate, you can fundraise with other candidates, 501(c)4s, or political groups. And you can always send out a Tandem 501(c)3 page as long as you don’t include your own campaign. If you want to create a Tandem form to raise funds for yourself and others, the candidate or organization that will actually be sending the form to donors should be the creator. This will highlight the fact that they’re making a personal ask on behalf of another group(s) and let them add their own branding to the form. Set up the contribution form as you normally would. Once you're happy with your form, go to the "Recipients" tab in the form editor. 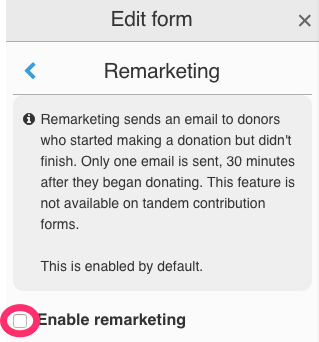 Before you can add multiple recipients, you need to turn off remarketing. 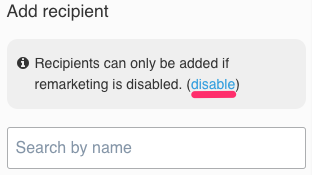 To do this, click on the "disable" link in the tab, or go to the "Remarketing" tab in the form editor and uncheck the "Enable remarketing" box and publish your changes. Once remarketing is turned off, search for the individual or group you want to add in the "Add recipient" field of the "Recipient" tab. Click on the name in the dropdown to add the new recipient to your form. 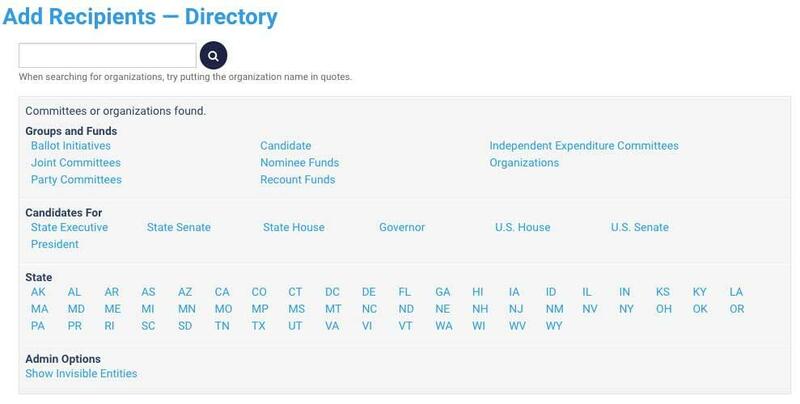 If you’re raising for a candidate, make sure you pay close attention to the election year and office listed, as there are sometimes multiple accounts per candidate. You can make sure you're selecting the correct recipient by comparing your dropdown selection to the results in our groups directory, which can be found here. Continue adding candidates or organizations until you’re finished. If you try to add a group and and see the message below after you click "Publish changes," it means their tax designation does not allow you to raise funds for them. If you only want to raise for others and not yourself, you’ll create the form yourself. You’ll just need to go to the "Recipients" tab of the form editor and click on the subtract sign next to your name (and then publish your changes). This is useful when responding to situations like natural disasters where you want to give your donors a chance to help others. If you made a mistake or want to delete a candidate or group from the contribution form, you can also remove them this way. By default, when a donor gives on a Tandem form their contact information is shared with every recipient on the form. If you are the managing entity on a Tandem form and you want to change this default setting so that donors are asked after they give whether they want to share their contact information with the other recipients on the Tandem form, change this setting to “ Yes”. This will show a pop-up box to donors that asks them to opt-in to share their information after they have donated. Please note that the entity that manages the Tandem form will always receive the contact information for all donors that give on the form (both those that opt-in and those that opt-out of sharing their information with the other groups), even if the managing entity has not listed itself as a recipient on the form. However, at this time managing entities cannot see which donors opted in or out of sharing their contact information with the other recipients. Remember to publish your changes when you're done editing your recipients and form permissions! 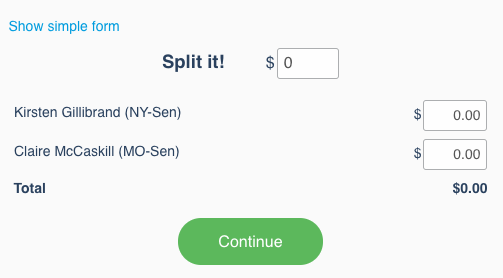 When your donors land on a Tandem Fundraising form, they’ll see the usual amount buttons with a note above them saying that their donation will be split among every group on the page. 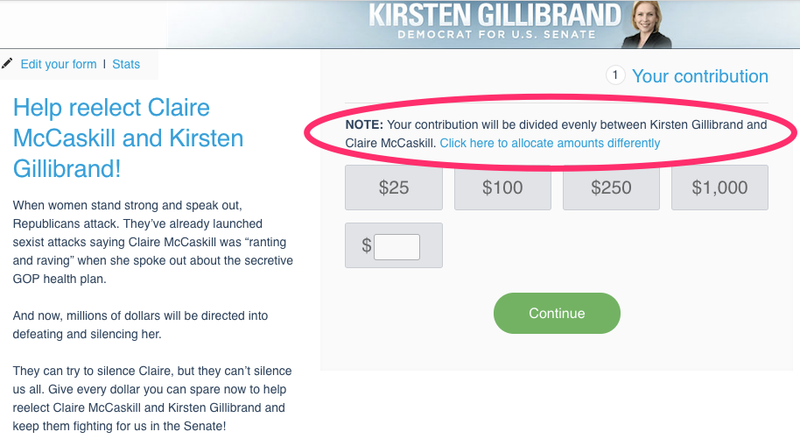 Here’s an example: Senator Kirsten Gillibrand ran a Tandem Fundraiser to help re-elect Senator Claire McCaskill. The form is branded to feature Kirsten so her donors will feel at home. If a donor selects the $25 button on Kirsten’s form, $12.50 will be donated to Kirsten and $12.50 will be donated to Claire. There is a $1 minimum for all donations, so if a donor gives $5 on a form that lists 10 groups, the first 5 groups will receive $1 each, and the rest won’t receive any donations. Alternatively, your donors can choose to split their contribution in a different way by clicking the “Click here to allocate amounts differently” link. The donor can then choose exactly how much they’d like to give to each individual candidate or organization, as shown below. Donors will receive an itemized receipt for their records with each individual contribution. The order your groups appear in on your Tandem form will stay the same unless you choose to randomize them. If you are listing more than a few organizations, we highly recommend using our randomization feature to avoid the first group(s) getting all the money when people don’t contribute enough to benefit everyone on the form. To do this, go back to the "Recipients" tab in your form editor and select "Random" in the dropdown for Recipients order. Publish your changes to save them. If you choose not to use the randomization feature, you have the option of manually dragging and dropping the groups to reorder them. To see how much you raised for yourself and the others on your Tandem form, go to the Statistics page for your form. To do this, click the "Stats" button on the form navigation bar (form navbar) at the top when you are viewing your form or click on the "Contributions" or "Amount" link for the form in Form Management. The first table will show your overall results — contributions to all of the candidates and organizations listed on the form, combined. 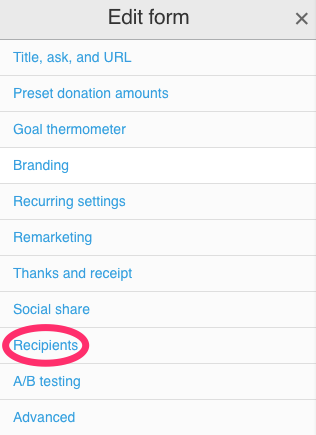 Scroll past that table and click on the dropdown menu for “Contribution summary by recipient” beneath it. Here you can see how much was raised, and by how many contributions, for each candidate or organization on your Tandem form. 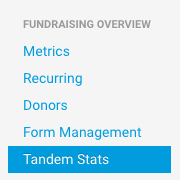 Every active entity will also have a Tandem Stats tab in its Fundraising Overview menu on the Dashboard. If you’ve run a Tandem fundraiser, you’ll be able to track and compare results for the groups you’ve raised for by clicking on this tab. You can search for contributions within a specific date range of two years or less. Tandem Fundraising is proving to be a key tool in the resistance movement. With Tandem forms, donors can give quickly to multiple candidates and organizations they care about, or they can build their own contribution forms listing groups they want to support and rally their networks around. It’s a great way for candidates and organizations with the same goals to work together and maximize their fundraising.